My good friend and former work-associate Chris Lusto recently set off a flurry of Twitter activity when he shared some of his thoughts on curriculum development in a post titled Lessons for Other People (he's since written a follow-up, Git Push). These posts have sparked a lot of interesting conversation, and have inspired me to share some thoughts of my own. In the interest of self-containment, let me begin by trying to summarize Chris' main argument. First, some background: Chris and I both spent a not-insignificant share of our professional careers writing math curriculum at Mathalicious. Writing curriculum is a lot of fun, but is also hard work, especially when you're trying to write for an audience larger than yourself. Different teachers may be looking for wildly different things: one may want something highly scaffolded while another wants something more open-ended, one may embrace a lesson on Cheetos while another may not...the list goes on, and on, and on. And on. Seriously. It goes on. One approach to solving this problem is to make content editable, so that teachers aren't forced to use a resource that doesn't fit quite right. But this raises other issues. For authors, it can potentially diminish the integrity of the resource. For teachers, making content editable assumes they have time to write content in addition to their full time jobs, you know, teaching. There's also the issue of cohesion. Having a coherent curriculum - one with a clear vision that can support a natural progression through a set of learning objectives - is undoubtedly important. This is especially true for a discipline like mathematics, which builds on itself over timescales on the order of years, not class just class periods. Chris's proposed solution, and I quote: "We need GitHub for math curriculum." I’d like to throw my two cents into the ring, mostly because for the last year I've been teaching adults how to code. Schools like this are popping up in major cities throughout the country. And though they may differ in the details, throughout this so-called "bootcamp1" industry one thing seems pretty clear: we already have an analogy of Chris' "GitHub for math curriculum." Across all of the companies in this space, GitHub is the primary means by which curriculum gets written and shared with students and instructors. So, how’s it working out? A "curriculum" for a bootcamp is much narrower in scope than an entire math curriculum. The program I teach lasts six months, but many others are even shorter, which means the cohesion required by a curriculum isn't nearly as complicated. From this standpoint, the development of a curriculum is much less likely to turn into a boondoggle. Metrics for success in my current industry are really straightforward. If your students get jobs, congratulations, you're doing well! If not, you may need to rethink your approach. In this sense, then, the "goal" of a curriculum for us is fairly straightforward, especially when positioned next to the question: "What is the purpose of education?" In terms of scale, the bootcamp industry has got nothing on math education. We're still nascent in many ways, with a lot of flexibility to experiment and iterate. The material itself is also continually changing to keep up with the needs of the market. What's more, our timelines feed into this flexibility: if I totally whiff on a set of lessons one day, I don't have to wait a year to try them again. This is not an exhaustive list by any means, it's just a list of the most pertinent things to be mindful of in what follows. I want to highlight them merely to emphasize the fact that, when it comes to GitHub (or CurricHub or MatHub or whatever you'd like to call a math education analogy), your mileage may vary. Let's accentuate the positive and talk first about some things that I like about using GitHub when working on curriculum. Many of these points tie into the potential advantages Chris wrote about. It's really easy to iterate on materials. If I see a typo in a readme, I can update it and have that change available immediately throughout the whole organization. If a lesson didn't go well and I have some specific changes to the materials that I think would improve the experience, it's easy for me to make those changs as well. If someone wants to make a change but is concerned about a lack of consensus, it's easy to get a discussion thread going. The reasoning for any change can always live in the same general location as the change itself. I can see who authored each change on a line-by-line basis. If I have a question about anything I'm reading, tracking down the original author is no problem. It's not all sunshine and puppy dogs, though. Let's turn to the downsides. Through the open source movement, GitHub has allowed software developers from all around the world connect and collaborate with ease. However, writing curriculum isn't the same as writing software, and I've found that even among teams that are geographically dispersed, the amount of collaboration between people who don't know each other is pretty minimal (if it exists at all). I use GitHub with my group of instructors on a daily basis to make improvements to our spin on the curriculum, but I have very rarely collaborated outside of my core group in the same capacity. Of course, this may not necessarily be due to a fault in the tooling (i.e. GitHub). Part of it may be cultural, and part of it is probably due to the wide variation instructors see across classrooms and across markets. The knowledge students need to get jobs in San Francisco may be different than what they need to get jobs in other places in the country, and each class has its own set of idiosyncracies which instructors will need to address on a cohort-by-cohort basis. Because of this, large-scale collaboaration of the type you see in open-source software development isn't really a thing. GitHub doesn't really reduce the amount of noise so much as it shifts it to a central location. Without a lot of careful and active shepherding, curriculum to which everyone can contribute can quickly generate a signal-to-noise ratio that's comparable to what's already available via a Google search. Say I'm looking within my GitHub organization for content on topic X. It's quite likely I'll find a lot of different curricular resources. Without a more personal relationship to the author, though, I don't have a clear idea of whether the material is a good fit for my class (see #1), and this is true even if our classes have a shared set of objectives. Moreover, objectives and requirements change over time, but not every piece of curriculum follows. If I see material that hasn't been updated in a year, is that because it's not great, or because one instructor really loves it and uses it while everyone else uses something else? Maintanence of a large body of curriculum is expensive, and between writing curriculum, teaching, and keeping the entire body of curriculum maintained, it also tends to be the lowest priority. Forking alleviates some of this, but not all. I could choose to not worry about the larger community and just keep a copy of my own forked curriculum updated as I see fit, but if everyone does that, we lose out on the benefits obtained from sharing insights into how things are going across different classrooms. It's difficult to push changes to the curriculum when multiple people are using it while also iterating on the curriculum quickly. If 12 different classes are using a shared curriculum, some of them may be teaching very similar things within a very short timespan. If one group decides to make significant changes to the curriculum, it has the potential to disrupt the planning of another class. For all of its technological street cred, GitHub hosts a lot of curriculum that's still stuck in the 20th century. Github is super awesome at keeping track of changes to text files. 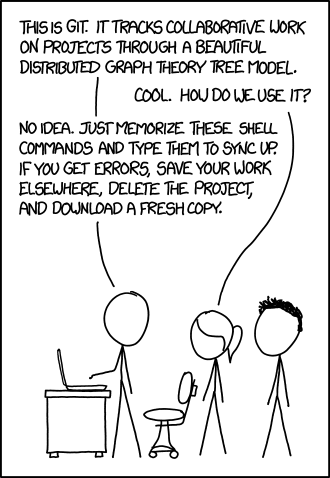 As such, people use it to keep track of text files. At its core, that's what software development is: reading and writing text files, all day every day. In terms of curriculum, then, GitHub tends to be used to store repositories of text files. This is fine; after all, we've been using text files to communicate curriculum for hundreds of years. But if you're trying to learn about families of linear functions, explore the relationship between graphs, slope, and intercept, and so on, wouldn't you much rather be able to explore linear functions with something like this? I certainly would. And examples like this are becoming more common. Desmos is getting into the content game, and Mathalicious lessons are much more interactive than they were a few years ago. In higher education, tools like Sage Math are positioning themselves as free, open-source competitors to expensive applications like Mathematica, Maple, and MATLAB. I'm not sure what this means about how curriculum should be tied to GitHub, only that the relationship is typically not harnessed to its fullest potential. Should curriculum live on GitHub, or should it be part of a larger, 21st century application that lives on GitHub? And what does this mean for curriculum authorship in the 21st century? These are questions that could take up posts of their own, so I'll merely pose them here as another place where I think curriculum and GitHub have room to grow. I've addressed the pros and cons of GitHub for my particular use case, with some guesses as to what's generalizable to others. In the end, though, Chris' article makes me think about a question that may be entirely unrelated to GitHub: what does a model of open-source math curriculum look like? It's easy to say that it looks like open-source software, but I don't think that's true. There are some similarities. For insatnce, an open-source curriculum, like a large-scale open-source project (e.g. React, Angular, etc) is likely to require a team of full-time employees to set the vision for the project, maintain the integrity of the curriculum, and release updates. In a traditional open-source software project, contributions from the community clearly benefit the owners of the project, but they also benefit all users of the project. Crucially, they also materially benefit the user who has their change rolled into the project. (Being able to say you are a contributor to a large open-source project can be a pretty significant bullet point on a resume.) But software developers have a fair amount of leverage in salary negotiations; consequently, I'm not sure how well this model fits with teachers, especially public school teachers whose salaries are on a fixed scale. Chris addressed this issue from another perspective in his follow-up post under a section titled Isn't this just a way for publishers to exploit labor? His rebuttal is nice, you should definitely check it out. Ultimately I don't know what the answer is, but this example is enough to make me think that the question of open-source curriculum is, regardless of how we version control it, big enough to consider on its own merits. I haven't thought a ton about it, but if you have, I'd love to hear from you! I'm sure the larger community would, too. 1: I'll use the term bootcamp throughout this discussion, even though I don't really like using that word to describe what I do (but that's a topic for another day). 2: Again, it's quite possible that this complaint has less to do with GitHub in particular than with external factors such as culture, workflow, etc. But at the very least, I think the idea of keeping a forked copy of your own curriculum to maintain while also folding in the best parts of updates to the main curriculum is, in practice, more complex than it seems.